Windham Middle School (WMS) has talent. A lot of it. 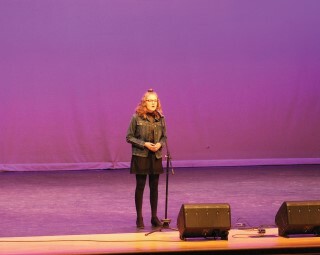 On Wednesday evening, April 11, the sixth, seventh and eighth-grade students at WMS, held a talent show in the Windham High School auditorium as a fundraiser to support students with needs; from food to clothing to school supplies. The talent show was hosted by D.A.R.E. officer Matt Cyr, who is familiar with this group of students; Cyr was proud and impressed by their many abilities. These students worked exceptionally hard, some were outside their comfort zones and put on several amazing performances. There were a variety of acts including singers, piano, guitar and flute players, dancers, a comedian and a karate enthusiast. Some of the performers included: Peyton White who sang “Corners of the Sky” from the Pippin Musical; Matthew Media, who performed a very funny comedy set; Alyvia Earle who sang “Loved by You,” a song she wrote; Mackenzie Daigle who played the ukulele and sang “Chasing Cars” by Snow Patrol; and Rachelie Cloutier performed an amazing karate demonstration. Each student gave 110 percent which was reflected in their performances. They worked very hard practicing once a week, since January, with Shelly Cook, an eighth-grade teacher at Windham Middle School, who helped organize the talent show. Cook said everyone came and gave it their all during those practices. WMS decided to have an evening talent show because Principal Patin wanted to provide a time when parents could see how hard their kids had been working over the last several weeks without having to take time off work. After all was said and done, the talent show raised over $550.